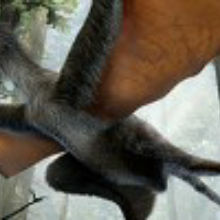 Analysis of an approximately 125 million-year-old fossil found in China creates a new upper limit for microraptor size. 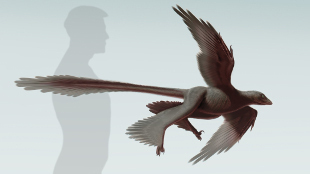 Illustration of the new raptorial dinosaur, ChangyuraptorSTEPHANIE ABRAMOWICZ, DINOSAUR INSTITUTE, NHMA team led by investigators at China’s Bohai University this week (July 15) described in Nature Communications Changyuraptor yangi, a feathered, four-winged dinosaur from the Early Cretaceous. 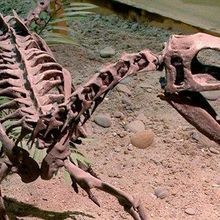 “With tail feathers that are nearly 30 cm [nearly 12 inches] long, roughly 30% the length of the skeleton, the new fossil possesses the longest known feathers for any non-avian dinosaur,” the authors wrote. 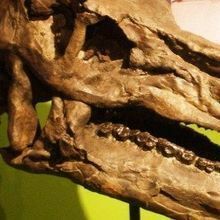 Changyuraptor was 1.2 meters (4 feet) in length and, at approximately nine pounds, was “by far the largest of the flying nonavian dinosaurs that lived about 125 million years ago,” The New York Times reported. Coauthor Alan Turner, an assistant professor of anatomical sciences at Stony Brook University in New York, told The Guardian that “C. 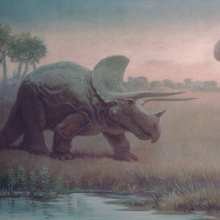 yangi was [like] a big turkey with a really long tail.” Whether the winged dinosaur flew or glided, he added, remains an open question.